May 03, 2012: My quick visit to Bangalore was heading to a close. I was desperately looking for tickets to return home. Thursday night plus summer holidays meant that almost every bus to Kerala was running full! I tried every operators’ website, but every bus was either full, or had only the last row seats empty. The story was same for Karnataka SRTC as well. I decided to check out the travel agents in Madiwala area. I headed first to Friends Travels – Kallada G4’s bus was full by then. Then went to Shama – they were full as well. Then tried a handful of operators including Kallada (Suresh Kallada), KPN, Viji, etc – all of them had tickets only to Thrissur bypass. Getting off at Thrissur bus at 4 or 5 in the morning is a nightmare – public transportation would wake up only after 5:30 or 6 in the morning. I decided to return home empty handed, and may be try out my luck with some train (yeah... a bit over-ambitious for sure). After returning home, I checked the railway site and was shocked to see that tickets were available (RAC, though). As usual, the IRCTC site was down – thus train goes out of the window. Tried desperately on the KSRTC (Karnataka) website to see if there was some luck – no luck though. Now, I was on Redbus to see if there was some ray of hope. That was not the case, again! I decided to change my destination to Ernakulam now, and checked for some buses. I finalized Viji-Yathra’s Pathanamthitta B9R – this one would leave at 2030hrs and reach Ernakulam at 0530hrs. The ticket fare was Rs. 1050, and I booked my first ticket on Redbus. The reporting time at Madiwala, according to the ticket, was 2015hrs. My brother dropped me at Madiwala around 1945hrs. I headed first to Viji-Yathra’s office in Madiwala – the guy at the office said the bus was already at the “petrol pump”. The fuel station – commonly known as “Friends Petrol Pump” – in Madiwala is a parking place for many operators in Madiwala region, and is also the boarding point for many operators now. The fuel station is not working anymore, and it is more of a “bus station” for Kerala bound buses now. The place resembled a peak hour government bus station. There was one SRM, Viji, Kallada-G4 and Shama B9R parked in that small piece of land. 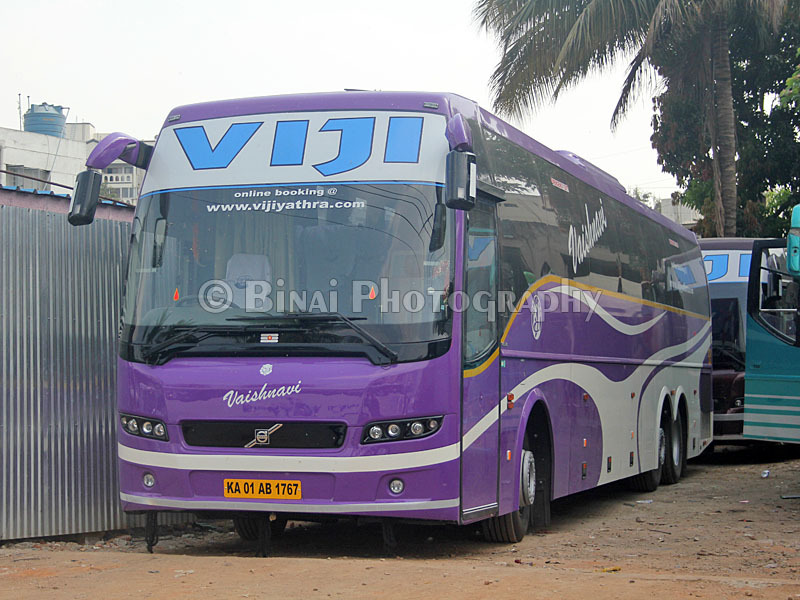 I headed straight to the Viji bus – only to be told that the bus was not mine. That bus was heading to Trivandrum. Around 2000hrs, the Viji Trivandrum bus headed out. The Shama B9R was parked properly, while the Kallada-G4 headed to Kalasipalayam to pick up passengers. The SRM started boarding as well. My bus, KA-01-AB-1767, came in at 2010hrs and managed to barely make space to enter the place. There was one Golden Travels’ two-axle B9R heading to Kannur as well. My bus: KA-01-AB-1767. The bus had about 34000 kms on the odo. There was not much light at the place, and it was confusion all around. There was nothing much to do, and hence I just got into the bus and took my seat. My seat was K4, a window seat in the last-but-one row. The bus was running 100% full that day. The guy who was verifying tickets had a tough time managing passengers – there were quite some “duplicate” bookings i.e., two passengers given the same seat! But, the guy somehow managed to seat all of them. The bus did not move even an inch upto 2030hrs – we were still half into the “bus station”. The bus finally reached upto the exit, but just backed up and waited till the guy finished checking all the tickets. He finished about 50% and signaled the driver to start. We started off at 2054hrs. When he came to, I reconfirmed if my bus would be entering Thrissur – the answer was “no” (as expected). I had booked upto Ernakulam anyway. The bus went through St. Johns, Koramangala water tank and came through Madiwala market. By this time, the guy had finished checking all the tickets and he got off the bus. Our bus had two drivers and one cleaner now. They played a movie as the bus got on Silk Board Flyover. The cleaner came to the back to see if everyone had received blankets (already kept on the seat) and to open the rear LCD panel. The lights were switched off as the bus reached Bommanahalli. We took the elevated highway to Electronic city. The bus had a pickup at the toll gate at the end of BETL! We had some more passengers joining at Chandapura (near Narayana Hrudayalaya). After all the pick-ups, the driver meant business, and he was flying, quite literally. We clocked speeds in excess of 100kmph immediately past Chandapura – he did a couple of high-speed ‘Z’ maneuvers, testing the stability of the bus big time. He was rash till the time we crossed into Tamil Nadu. He mellowed down a bit after entering TN (may be due to the fear of speed-checking). There was thankfully no traffic block near Hosur checkpost. We rushed into Hosur flyover at three digit speeds (as usual), and the speed was maintained for quite some time. Heavy traffic slowed down our progress as we neared Krishnagiri (thankfully – the speeds he did until then wasn’t very comfortable). The movie was getting stuck very often – it got more irritating as the bus hit bad roads. The movie was switched off as we neared Krishnagiri. I drew the curtains close, and got set to sleep after the movie was switched off. All lights – including night lamps – were switched off. The driver was back to three digit speeds again now. My GPS was going crazy with the kind of speeds our driver did (the top speed was only 105kmph), but the way he reached the speed was crazy. I dozed off as we were approaching Dharmapuri. I woke up as we were entering the flyover at Salem – he entered the circular approach at high speed, almost throwing out my co-passenger from his seat. I slept off after we stabilized on the highway. I woke up just as the bus entered the regular fuel station at Perundurai for break, at 0134hrs. The bus took in 225lts of diesel, while the passengers emptied their tanks. The break was quite short – the drivers just took a quick loo break, and took tea from a vendor present at the petrol pump. No refreshment options for passengers. We got moving from the fuel station at 0143hrs. Now, that was a very quick break. I was back in my seat, trying to continue my sleep. Just sometime after we resumed our journey, I noticed that our bus wasn’t taking the regular route. The road seemed smaller than the regular route. I quickly switched on the GPS on my phone, and checked which route we were heading on. It turned out that we were now heading to Tiruppur. The bus took the Chengampalli-Tiruppur-Palladam-Irugur route, and reached Coimbatore bypass. It was the usual route after we got on to the bypass. I had a nice sleep after Walayar. I do not remember seeing the bus stopped anywhere. Guessing by the timings, I believe there was no traffic block at Walayar, either. I vaguely remember feeling the bus hitting the rough patch near Kuthiran. I woke up only when the cleaner called out “Mannuthy” and the lights went on. We reached Mannuthy (Thrissur bypass) at 0442. About 5-6 passengers got off, and a whole lot of parcels were unloaded. I was perplexed if I should take the risk of getting off at the bypass – it’s a nightmare to reach the bus station at that time, and autorickshaws are sure to rip off my wallet. I decided to continue to Ernakulam – getting transportation at Ernakulam would also be an issue, but the distance involved would be lesser. We started off from Mannuthy at 0445. Three minutes is all it took for them to unload quite a lot of parcels! I slept off again after Mannuthy. I vaguely remember seeing the bus cross the controversial toll gate at Paliekara. I dozed off again, and woke up just when the cleaner called for a passenger getting off at Ankamaly. The time was around 0515 or so. I slept again after that. I woke up just as the cleaner shouted again… this time “Aluva”. A split second decision – I decided to get off at Aluva. I jumped off my seat just as the bus was about to stop. It was a struggle to get my bag off the overhead bin. By now the bus had stopped. I rushed out of the bus. I was dropped at Aluva, at 0530hrs. We covered around 520kms in 8 hours and 36 minutes. That was an impressive average speed of 60.47kmph. The bus was well maintained. It was clean as well. The shawls were thicker than the ones given on some other buses, but were too narrow (as usual). Water bottles were not provided. The bus was delayed throughout the run - started off with a 24 minute delay, and perhaps maintained the same delay at Aluva. The driving was not great - rash at times. They maintained three digit speeds most of the times - but the driving was not very confidence inspiring. I've done such three digit speeds even earlier, but never felt so insecure. Overspeeding by these operators are a cause for concern - it is these over-enthusiastic travellers who force operators to be rash - people want to leave late from their workplaces and reach their destination at the earliest. The roads cannot be safe unless we stop operators from being rash. Recommended? Not really, but this operator is mostly the cheapest on the route. Will I take this service again: Only as the last option! I don't trust this operator for a nice journey. Too dangerous driving in my view also. Only one thing is that they will reach EKM around 6(before Shama). I have travelled a couple of times with this operator. once, i took their tvm bus which started off at 8.15pm and reached ekm at 4.10am. as you said they drive at break neck speeds, but i should say, this particular driver, from tvm, i guess had ultimate control on the bus.